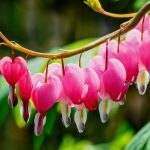 When is the best time to divide bleeding heart plants? This can be done in fall or early spring before plants get more than a few inches tall. I suppose you could transplant later but I suggest you cut back the foliage by half to lessen stress on the plant. The roots are brittle when large. If a piece breaks off, it may send up a brand new plant so space it accordingly.